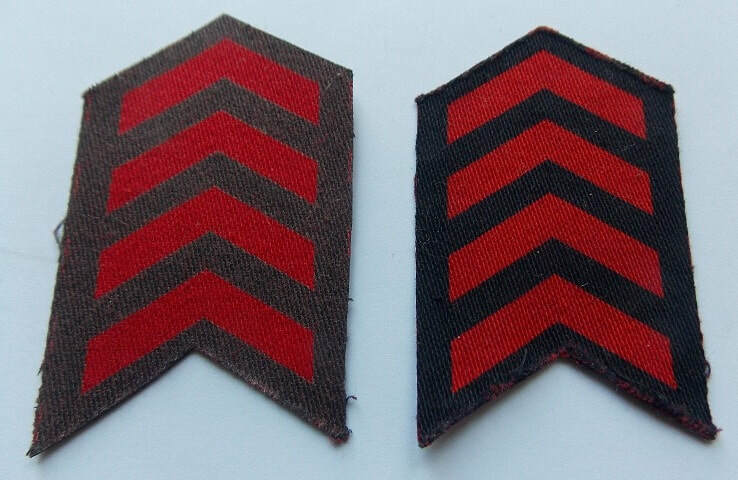 Introduced in February 1944, war service chevrons, which were identical to those awarded to army personnel, were worn on the lower right sleeve of the civil defence jackets. The designated position (as per ARP Memo 17) was midway between the sleeve seams and the apex of the lower chevron was four inches from the end of the sleeve. Each red chevron denoted 12 months' service in the Civil Defence services since hostilities began on 3 September, 1939. Information on War Service Chevrons from ARP Memorandum 11. ​The red on dark navy blue chevrons were available as a printed badge - from a single chevron to a group of four. The apex of the chevrons point up and a maximum number of five could be worn. Printed service chevrons - each chevron for 12 months' service in the Civil Defence. Below is a comparison of the two different colour backings on the chevrons as outlined in ARP Memorandum 11. For wear on the gabardine coat (ARP Pattern 81) is the blue-grey (on the left) and the navy blue (on the right).